Pia and Per is a children enamel silver jewellery range from Norway. This brand has been arround for 70 years. 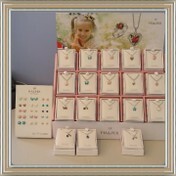 This range of jewellery is suitable for girls and boy 0 to 1o years of age. We focus on bright colours and cute designs flower, hearts and butterflies for girls, and tractors, firetruck, motorcycle and soccerball for boys. It is great to dress your kids up with accessories that suit their age. The enameling is done by hand with precision and great skill from decades of experience. The high quality product which has been available in Norway for generations is now in Australia through selected outlets.